“Before we continue, Mike, would you like to describe how your Character looks to the group, I’ll describe mine as well,” speaks Johnny. “Uh… Yeah… Sure,” replies Mike. “He sounds cool,” interjects Barry. “Thank you Mike… My turn,” speaks Johnny. 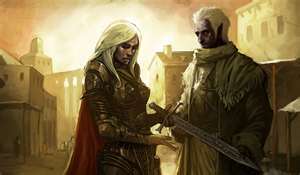 “Alright, so the two of you enter the CRIMSON BLADE TAVERN, the thriving, two story Tavern of the City of JOR. “What do you do?” asks Johnny. Zhan looks around a bit until he spies a large board where Job Listings, and Wanted Posters are nailed up. He walks across the Tavern, drawing a bit of attention due to the determination of his stride, meanwhile Tor-Atimus approaches the bar, “Ale,” he speaks. A pretty-ish, blond barmaid responds,”You got it big fellow…” she winks, then fetches the ale. Tor-Atimus laughs slightly, and then receives his ale. The same blond barmaid points to an extremely friendly, grey and black, balding man some 25 feet down the bar. He’s around 5’7″ tall, 135 pounds, and looks to be in is 50’s. He also has a long silver black beard. “Alright,” the man says with a smile. “Also, my friend here,” he gestures towards Tor-Atimus, “And I, need two rooms… We’ll likely be in here, or in our rooms, should any come asking… Bother us at any time,” speaks Zahn. “Grhumpf,” Tor-Atimus makes a sound. “Rather, bother me any time, leave my friend alone if he’s sleeping,” Zahn says with a smile, and the man nods. “Good meeting you,” responds Zahn. “Barry, would you like to describe your Character,” speaks Johnny. “You bet,” Barry starts to scramble through his drawings, “Here’s what he looks like,” he’s about to hold up one of his drawings, but pauses. “Thank you Barry, lets continue,” speaks Johnny. …and as he did, everyone in the Tavern seemed captivated, and joyous. At the end of the song, he approaches Zahn and Tor-Atimus, and bows. “Good morrow sirs, I hope I find yee well,” he spoke in a most charming tone. “Why… Yes… Tired from our travels, but quite inspired by your playing, and words,” replies Zahn who seemed quite delighted to meet the Elf. “And you sir,” the Elf questioned Tor-Atimus, who unexpectedly, was also caught up in the Elf’s charm. “Quite well, er, what was your name?” asked Tor-Atimus. “Why my name is KINNER, Bard, and general Entertainer,” he spoke. “A Bard… Well met… How good it would be to have you with us on our travels,” spoke Zahn. “This is why I’m here… There’s only one thing I needs ask you,” spoke Kinner. 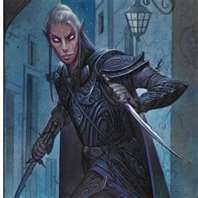 Suddenly his face transformed from pale skin Elf, to red eyed, black skin, grey haired, “I’m a Drow you see… And not all are comfortable with this,” he spoke, then his disguise returned, and he appeared as a pale skinned Elf once more. Zahn smiled, “Well,” then looked over at Tor-Atimus. “I’m a Half Orc… You’ll find no judgement from me,” spoke Tor-Atimus. “Well then… There’s your answer,” spoke Zahn. Kinner lives and breathes his Musical Tales of Heroes Old and New. When he plays his Violin and Sings, he goes into a sort of trance, inspiring those around him to pursue great and lofty deeds. Not very smart, nor wise, Kinner’s music seems to come from some other place completely. Though he’s had not much need to use it, Kinner is quite good with a Rapier, and also carries a Hand Crossbow and Dagger, just in case. 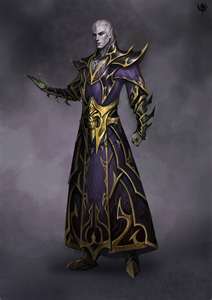 Being an Elf, he has Darkvision, and because he is a Drow/Dark Elf, he’s able to see not 60, but 120′ in the dark. Being of an underground breed of Elf, however, he is hindered both in combat and perception during the day, when relying on his eyes. He prefers to travel, and exist at night, though he knows his future Party members will likely do the opposite. Also like all Elves, he is difficult to ‘Charm’ via Magic, and can not be put to Sleep by magic. And like other Elves, he need not sleep at night, instead goes into 4 hour Trances. He’s also ‘secretly’ magically inclined. Kinner realizes being a Drow above ground will have its’ setbacks, beyond his homeland, but he will approach these things with great Humor, and Heart. “Ornast come for payment… Ornast want it now” or rather the largest Orc, any of them had ever seen. “Uhh…” Ems drew forth his axe, and nudged Ukorian, apparently both of them had fallen asleep on guard. Ukorian jumped up and drew his sword. “What the?? !” spoke Ukorian. 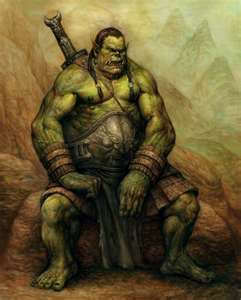 There Ornast, a giant Orc, sat on a rock in front of them like he’d been waiting for a while for one of the party to awake. By now Iloh, Dark Rider, Largoth and Elsya had woken as well. Ornast scratched his head “Ornast thought he already say that… You make Ornast’s head hurt, want gold now, or will let her go”. 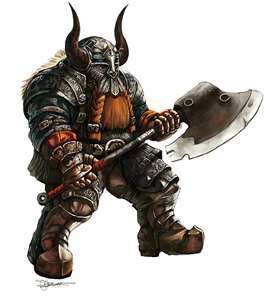 With this Iloh stepped forward and handed the Orc a small bag of silver. “There you go…”. Ornast looked inside “Thank you woman… We hold Drow for three days, then let her go…”. Ornast started to walk away, and then turned back “Or we eat her…” with this he smiled, bearing his large, sharp yellow teeth. And then he was gone. “The Drow of Nowynhall are tracking us…” spoke Ukorian. “So it would seem…” replied Dark Rider. “Lets move out…” spoke the Dark Rider, and so they all mounted and headed on. Soon they reached the Shenn Village of Mond… It seemed quiet enough… Perhaps too quiet… “Ems, Ukorian… Check the perimeter of the Village…” ordered Dark Rider, and so they did. “Iloh, Largoth, watch the streets, Elsya and I will head into the Tavern…” Iloh and Largoth nodded and looked for spots to watch the streets. As Elsya and the Dark Rider headed into the Tavern, the Villagers scuttled along, and looked very nervous. 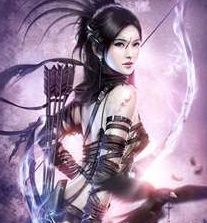 But before Dark Rider and Elsya could enter the Tavern a voice came from behind them. “You really wont be needing to go in there…” it was him. The Scarlet Bandit. “So you are the famous Dark Rider I’ve been hearing about… Interesting…” spoke the Bandit. Dark Rider moved into an attacking position and drew his swords, as did Iloh who had now approached. “And you are the ever illusive Scarlet Bandit…” Iloh spoke antagonistically towards the Scarlet Bandit. “Well, well, the Ranger Iloh too… Oh I am honored… Who would have thought little ol me would draw so many Noble Opponents”. Ems, Ukorian and Largoth now approached, as the Village Streets started to clear. “Lets finish this…” Ukorian spoke, his hood drawn, and sword ready. “Not so quickly…” suddenly a voice came from behind Dark Rider. 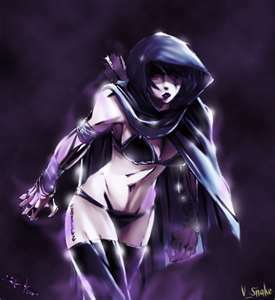 “A Drow Ranger…” Elsya said in a surprised tone. With this Iloh turned and faced the Drow Ranger. “But, the Priestess Androna–” spoke Iloh, but she was interrupted by Largoth “Wanted us killed far away from Nowynhall…” spoke Largoth. Just then another Drow appeared behind Ukorian and Ems. 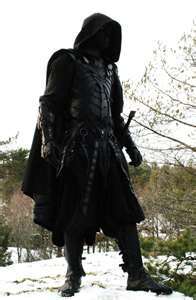 “An Assassin” Dark Rider spoke when he saw the second Drow approach. Ukorian and Ems turned to face him. “You see” spoke the Scarlet Bandit “There’s no point in you going in the Tavern… When a most certain death awaits you out here…”. And so the Dark Rider and his comrades began their three day journey to the Mountains of Shenn. 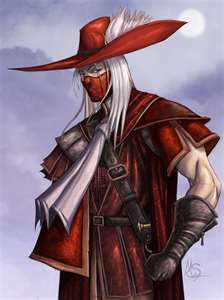 Apparently the Scarlet Bandit was paying a visit there to collect money from the Mountain Folk that feared him. A sort of “Pay or Die” sort of tax that the Scarlet Bandit had imposed on many small towns and villages. After a day of traveling, they made camp. “This isn’t going to be easy, is it…” spoke Iloh to the Dark Rider. Suddenly Ems approached Iloh and Dark Rider “What’s this I hear about you being a Ranger?? I thought you were merely a Warrior”. Iloh did not reply “I’m going to get some rest” and stepped away. “Well, excusseeee me for trying to stir up a wee bit of conversation… It’s not like Dark Rider is going to talk to me…” he directed this towards Dark Rider who did not reply, as he sharpened his dagger. “Yah see…” Ems walked off to post guard. There travels were fairly uneventful, and so they made good time to Shenn. 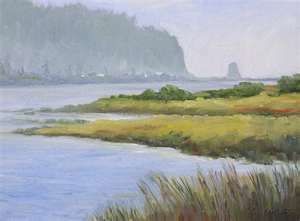 At the time they arrived, and started the mountains incline, the weather was cool, but there was no rain or snow. Deep into the mountains they wined, and soon night had fallen upon them. “Up there…” Largoth suddenly pointed towards some smoke that could be seen rising from the distant trees. “Looks like some kind of camp… I’ll check it out” spoke Iloh. “I’ll come with you…” Elsya interjected. Iloh nodded at her, and the two of them were off. Meanwhile Ukorian, Ems and Largoth prepared camp, but waited to light their fire until they knew who it was up ahead. When Iloh and Elsya finally reached the camp, it appeared to be Orcs. “Orcs…” Iloh spoke quitely to Elsya who nodded. “We camp without a fire tonight, and double our guard…” Iloh finished. The two of them then quietly made their way back to camp, wiping away their tracks as they went. One being an Elf, and one being a Ranger, this was not difficult. Meanwhile in the shadows, they were not alone. 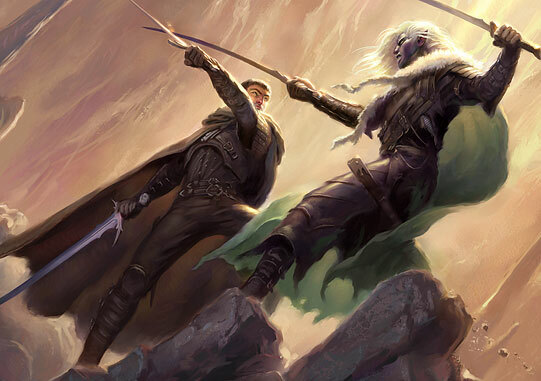 “You shall regret the day you entered our Wood, human…” the Drow spat at Ukorian. “Stop you fools, or you shall alone start a War that neither of you will live to see” a voice came from above the Drow and Ukorian, and a great wind… As if something had flown over them. Sweeping down upon a Dragon, she landed near the two of them. The two of them looked at one another at a loss, as they thought of it more as a common Bar Brawl, then a National Crisis. “I have seen enough…” the Drow spoke, then ran off. “So you’re a Dragon Rider…” spoke Ukorian. 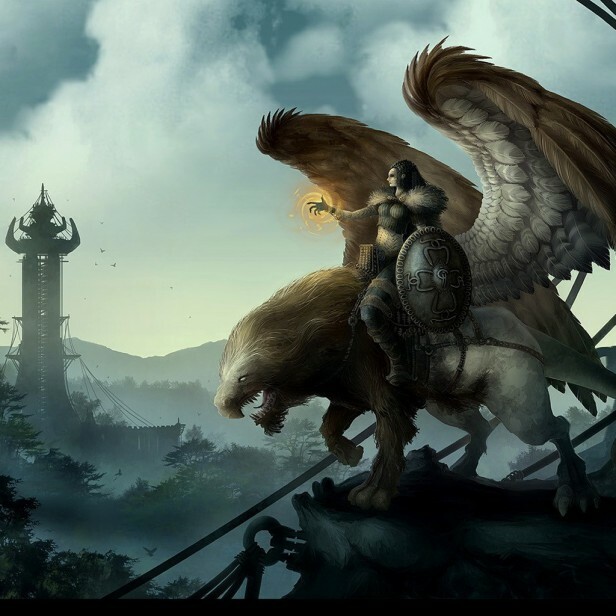 Elsya mounted once more “Only when I need to be…” she lifted again into the sky, and disappeared. Meanwhile the guide had lead Iloh and the Dark Rider back to camp, where Elms snored away, and Largoth greeted him most warmly. “You’ve returned…” Largoth exclaimed. “Aye… that we have” Dark Rider replied. 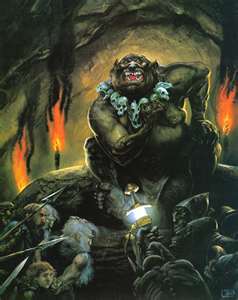 “I am here…” Ukorian replied as he stepped into the firelight. “Here Dark Rider…” Elsya too stepped into the firelight. “With this Iloh smiled deviasly…” The two of you have been up to no good… I can smell it”. Ukorian looked at Elsya, then Iloh. “Meh…” and geared his horse. Suddenly a Nobly dressed Drow appeared. 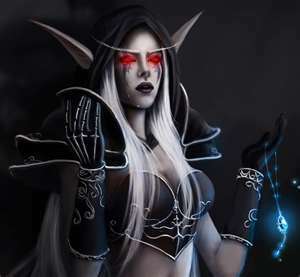 “I bring word from the High Priestess Androna…” with this the Drow holds out a Scroll. Largoth takes it, and reads it. “It’s the location of the Scarlet Bandit?” Largoth looks at Dark Rider, then Iloh. Iloh stepped forward “But the High Mistress–“she is then interrupted. 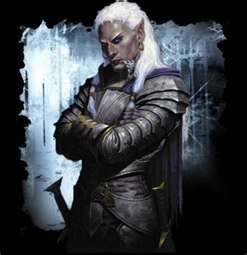 “It appears as though one of our kind attacked one of your party…” with this the Drow looks at Ukorian, and Ukorian back at him with a grimace “Meh”. “I get it…” the Dark Rider interjected. “Thank Androna for us” with this he mounts, as do all the others. “Lets move out… As he will not be in the same spot for very long…” and so they do. As the night fell, the Dark Rider and Iloh, lead by the Drow, came through the dark mist that surrounded them… And then it appeared. Nowynhall. 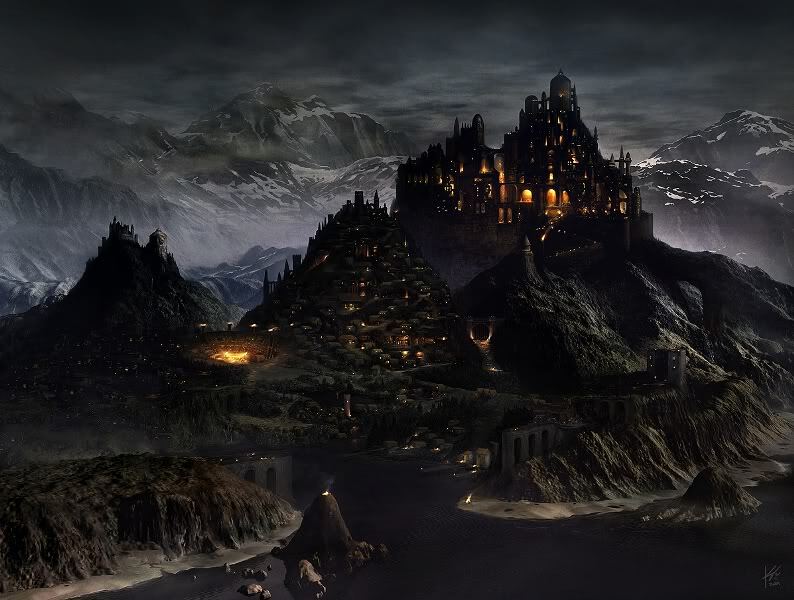 The Legendary, bordering on Mythical Dark Elf City. It was… Enormous. “I see you Drow don’t strictly stick to the trees…”. 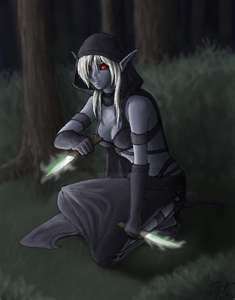 With this the Drow looked back at Iloh and gave a menacing grin. He nodded at their guide, and sneered darkly at the two humans, eyes glowing a dark yellow. Meanwhile back at the waiting post, Ems had made a fire, and dugout some ale. 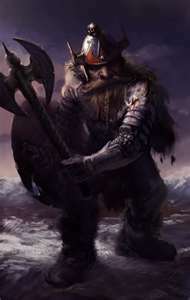 Ukorian, unable to sit still for very long, was patrolling the camp. Uneasy at best, Largoth stood at the northern edge of camp, looking outward. Elsya approached him. “You are worried…”. Largoth looked at her “Nah…” he replied. She in turn smiled slightly “Well, maybe…” he spoke a second time. “I find it very strange that they so willingly let them in… We have no sort of alliance with the Drow… None at all… They live separately from the rest of the land… In their own world if you will” he explained. 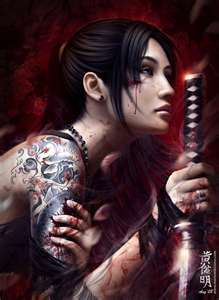 “I need go for a bit, but I shall return” spoke Elsya. “Alright then… Be safe” she nodded, and disappeared into the night. Nowynhall appeared as most cities in regards to inhabitants. There were Merchants striking deals with Warriors. Children running around, Maidens selling Flowers. But for the most part, when they’d pass, most just stopped and stared. “We’ll be there soon…” spoke the guide. And before they knew it, they were brought into the main temple, and approaching the courtroom door. “Well well well…” spoke a drow that appeared to hold some position in the court. “Owan, these two humans seek council with Androna…” spoke the guide. “Do they now” he moved aside. They went into a beautifully lavish courtroom “I will leave you to it” surprisingly the guide drow left. The Dark Rider and Iloh stood in the middle of the courtroom in silence. “So you desire court with Androna do you…” Androna suddenly stands before them. Iloh looks at the Dark Rider, and is about to speak when he places his hand on her arm and instead speaks. “Indeed we do…”. Andora sits upon a great chair. “Speak then”. “You know of a man called the The Scarlet Bandit…” Androna picks at some beautiful Drow grapes, and replies. “I do”. Iloh steps forward “Then you know of the terror that he has spread upon the trade roads of Trone, as well as many other surrounding cities…”. Androna continues to eat her grapes. “How does this concern us” she replied. “It doesn’t” spoke the Dark Rider. “Only that you might know his whereabouts, we are seeking him out”. She stops eating, and rises as if to leave. “You have great girth in coming here, I’ll give you that” Iloh looks over at the Dark Rider. “But I will not help you…” Androna leaves and the guide reenters the chamber. “I”ll take you back to your party…” spoke the guide. And so they leave the great courtroom. After searching the Wetlands of Cotrice, and the Valleys of Dondu, one thing was beginning to become quite clear to the Dark Rider and his Companions… They weren’t going to find the Scarlet Bandit this easily. 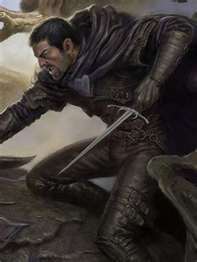 Largoth had explained to Dark Rider that the Scarlet Bandit was no ordinary Thief… No, he held Alliances with such people as the Griffon Riders of Elue, the Orcs of Darkshrone, and the Nocturnal Race of Dark Elves, known as the Drow. 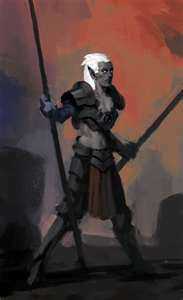 Of all of them, The Drow were the most Intelligent, and threatening. They were also the most likely candidate for finding out information about the Scarlet Bandits current whereabouts. And so they headed North West to the Great Kingdom of Nowynhall. Knowing full well, that the Scarlet Bandits Allies were all around them. Watching them, and surely sending word to the Scarlet Bandit, and/or his Outer Eyes as he referred to them. Ems replied. “Quit your bickering Iloh interjected…”. “You’ll know soon enough Ems, as the Night Falls around us, and we are nearing the outskirts of Nowynhall… Ha” Ukorian prodded at Ems. “Ehhh…” Ems replied. “Quiet… What’s that up ahead…” spoke Dark Rider. 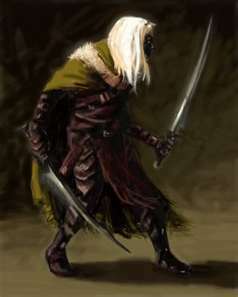 Suddenly from the dark, a Drow appeared. “One thing you’ll find out very quickly about Dark Rider is, he seldom jokes…” Elsya takes note of Iloh speaking in behalf of the Dark Rider. 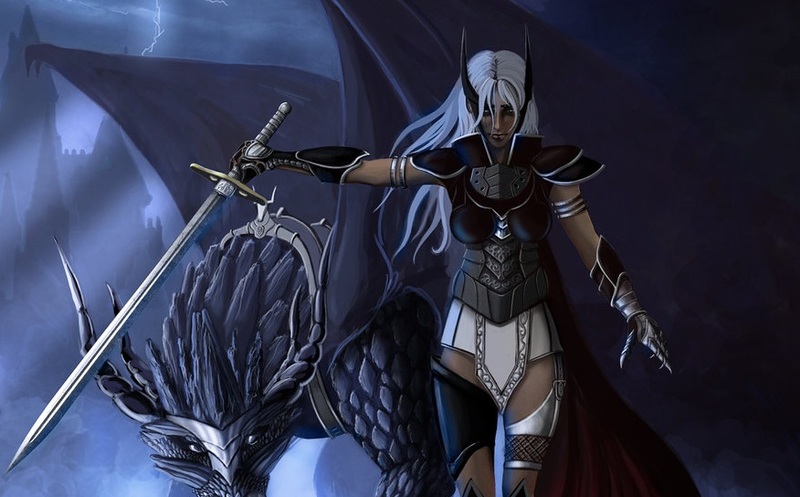 “True enough–” Largoth begins to speak, but is interrupted by the Drow “I will not speak to the likes of you Thalon Mercenary…” she spoke at Largoth, she then looks at Elsya “Nor you Rendolyn Shape Shifter…”. “Ha, that’s pretty funny… You don’t like Elves either, and you are one” mutters Elms. With this she quickly shifts her glowing green eyes at Ems. “Nor you Dwarf”. “Mfff” he murmurs. She then casts her stare at Iloh, Iloh bows slightly. “A Tanarian Ranger… Now she I will speak to” all of the party seem surprised to hear Iloh referred to as a Ranger, as opposed to a Warrior. 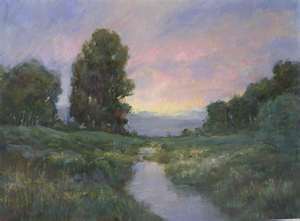 Iloh then steps forward “We request admittance into your Great Kingdom, to come to Court with one of your Rulers there. Would this be at all possible, respectfully”. The Drow thinks for a moment, “Yes, I do believe it would be… For you…” she points at Iloh, who bows again, “…and you” and points to Dark Rider. 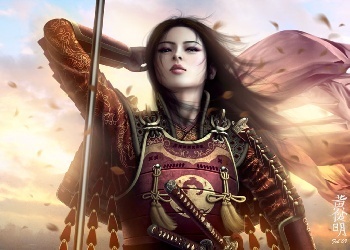 “The rest of you must stay here, I shall see that you are not attacked…” she smiles and walks away “Maybe…”.